A review of web contents and scientific papers concerning the backpacking market revealed an apparent lack of statistics data in terms of revenues and international travel patterns. Only Australia seems to be paying particular attention to this specific market, providing accessible statistics through institutions’ reports and other sources. On the other hand, many authors such as Cody Paris, Gregs Richard and Mark Hampton have been very busy in explaining the social phenomenon of Backpacking and its development process. From these considerations was born the idea to create an approximated index representing the propensity of a specific country to be suggested for a backpacking travel. The analysed sample is composed of 20 different websites (travel blogs, online-magazines, online-newspapers and organizations’ homepages), selected within the very first page of results shown on google.com/de/at/es, so that the statistic could be considered representative of the most visited platforms. All the websites were accessed on the 7th November 2013. 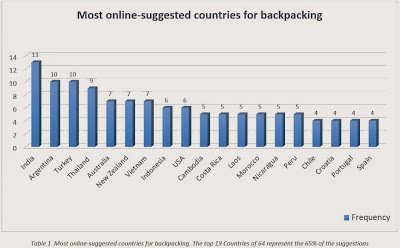 The researched keywords are: “most visited countries by backpackers”, “countries for backpackers”, “top backpacking destinations”, “backpackers destinations”, “most popular backpacking countries”, “backpacking must-see”, “top 10 backpacking countries”, “best countries for backpacking”, “top 10 backpacking”, “top 10 backpacking Reiseziele”, “top 10 destinos mochileros”. Different websites presenting the same list of countries in the same identical order were systematically not considered in order to avoid the use of repeated data. Only websites listing a minimum of 5 and maximum 10 countries were selected for the statistic. Several times, near countries such as Chile and Argentina or Vietnam and Thailand were listed in the same voice/suggestion, in these cases the suggestion was split and considered as two ones. During the research, a clear propensity to associate the terms “Best backpacking-destinations” and “Cheapest backpacking destinations” was detected and therefore, also rankings listed as “cheapest” or “on budget” destinations were included. 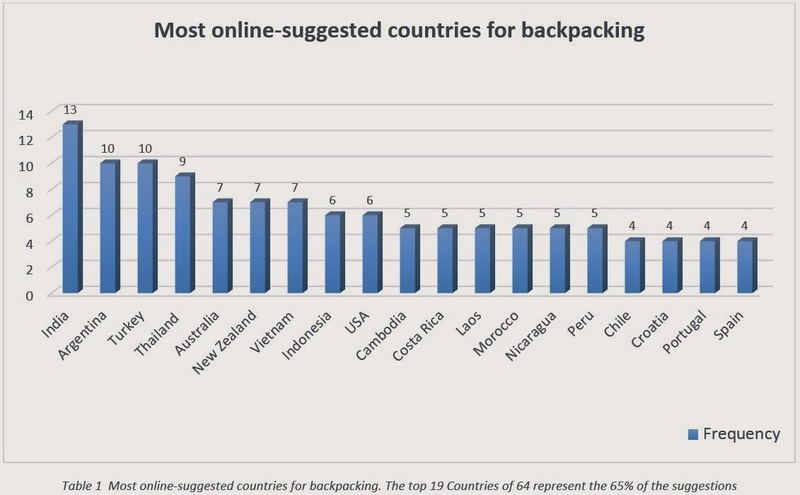 Some of the websites reported the decision to not included Australia among their suggested backpacking destinations because considered too obvious. Said this, we can assume that results concerning Oceania may be not representative. At the end, a total of 186 suggestions were collected. As result, 64 different countries from all-over the world were suggested and almost 50% of them (31 countries of 64) were suggested only once. The most online-suggested country resulted to be India with 7% of the total suggestions, there follow Argentina and Turkey both with 5.4%, and Thailand with 4.8%. When grouped into continents, Asia was first for number of suggestions with 30,1% of the total, then Europe at the second place with 19,3%, third with 15.5% was South America, then come Africa and Oceania, respectively with 9.1% and 8.1%. The large number of different countries suggested, is a factor that represents the high subjectivity in determining the country to be recommended. This subjectivity may be based on readings, personal experience and other people’s experiences. As we can see in the chart, the majority of the most-suggested countries, are nations which offer a very low cost of life and many of them are still considered as undeveloped ones. We can then affirm that a strong relationship between low life-cost and most suggested countries constitutes one of the main characteristics of Backpacking. The most important point of the results, is the lack of correlation with international standards (UNWTO Tourism Highlights 2013). Curiously, only three countries of the UNWTO top 10 ranking are present in the top 20 of the most online-suggested ones; France, which is the first of the top UNWTO destinations, was not even suggested once across the collection of data, the same is true for United Kingdom and Russian Federation, which were respectively eighth and ninth. 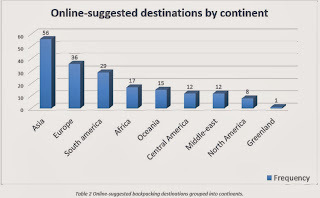 This indicates that backpackers are more likely to choose their destinations avoiding international trends, creating new patterns and defining alternative touristic flows, outstanding as a different and independent market. This pattern is better represented when the most online-suggested countries are grouped into continents, This pattern is better represented when the most online-suggested countries are grouped into continents, see the graphs.